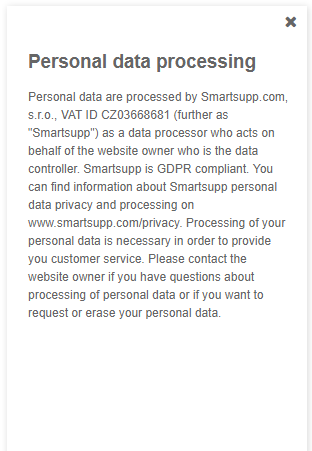 After you successfully install Smartsupp on your website, the first thing that you would probably want to do is to set up the appearance and functionality of the chat box on your website, right? Tip! Do you have a multi language website? You can change the language on different mutations of your website with just one line of code, using API. 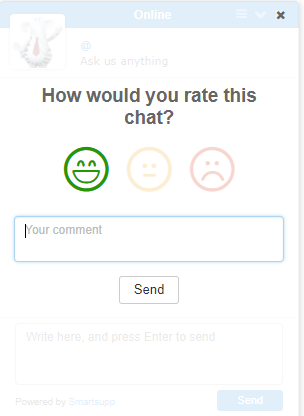 By default, the chat box is displayed in the bottom right corner of your website. But, in case, that it’s blocking some important part of your website, or you simply don’t like it there, you can change it to the bottom left side by changing this option. Tip! 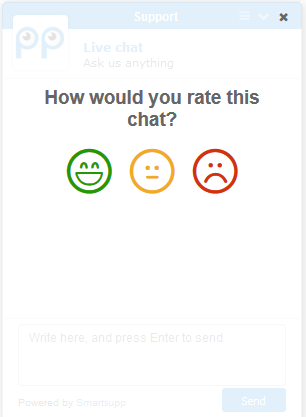 Are you a developer, or an experienced user and would you like to play more with different positioning of the chat box on your website? Check out our API documentation! Turn on the agent rating, if you wish to know how well your agents are doing when communicating with visitors of your website. This feature is especially useful, when you have multiple agents, and you want to continuously improve the quality of your customer support. What could be better, than gathering feedback directly from your customers? You can also ask a visitor for the text comment. 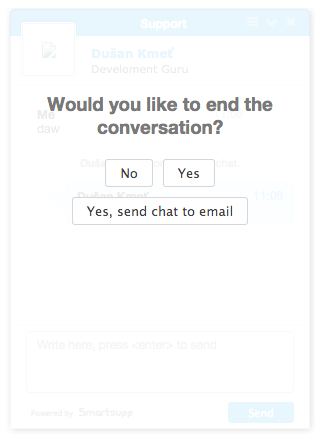 You can allow visitors to send a chat transcript of a conversation to their email after the end of the conversation. 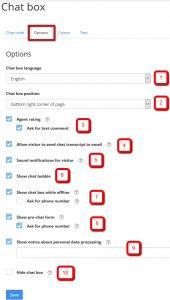 This way, you can save valuable time of your agents, because they do not have to do this manually. 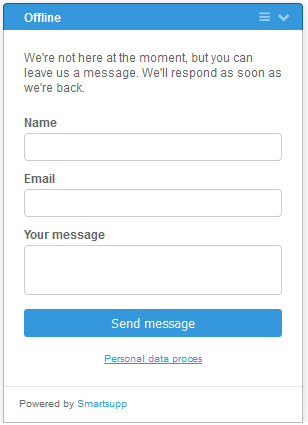 If you check this option, your visitor will hear a sound on your website for each incoming message. Less is sometimes more. 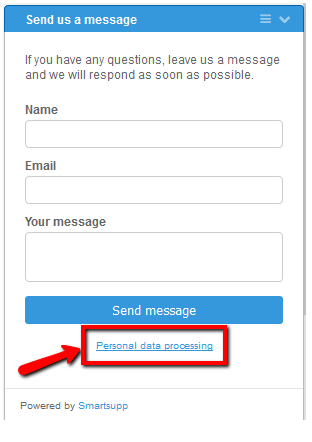 If you have this option enabled, we recommend using less automatic messages, so your visitors are not unnecessarily annoyed by the sounds of every incoming message. You can’t be online 24/7, but you still want to give your visitors a chance to contact you, right? Tip! If you are web developer, check out our API documentation for advanced changes! A useful feature when you want to know the email address and the name of your visitors (or optionally their phone number). This way, even if you miss the conversation, you can contact your visitor via email. Tip! 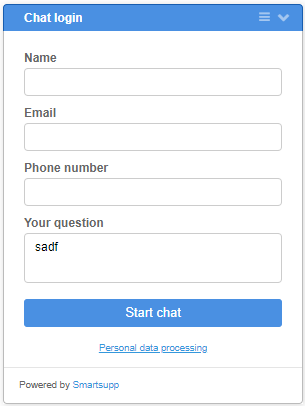 You can add custom columns to the pre-chat form using our API! Is your website in development, or are you just currently too busy to provide chat support ? No problem! 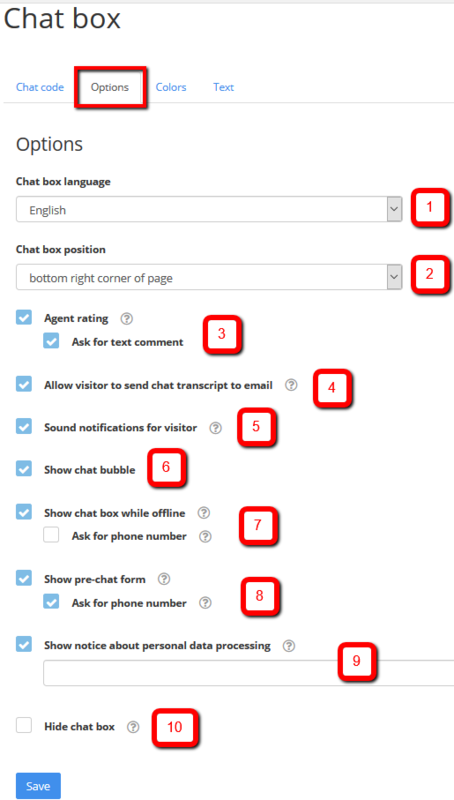 Use this option and hide chat box from your website until you are ready to answer your visitors.